The Rules node is available in the Pro version of Retrobatch. Rules filter out images based on set criteria. Rules are a powerful way of sorting images quickly based on the listed options below. Click the '+' button in the inspector palette to add additional rules criteria within the same node. See the image above as an example of combining rules. Tip: Hold down the option key to duplicate a Rules node quickly. This is a timesaver when sorting images that 'contain' an option in one branch of a workflow, and creating a separate branch for images that do not contain that option. Just change the top dropdown menu of the duplicated Rules node to 'none', and follow-up with a Write Images node. The top classification, any classification, and classification confidence options require that the Classification node be present before the Rules node. File Name: Option for separating images based on whether the file name contains, matches, is like, begins with, ends with, is, is not....compared to the manually entered text. File Path: Option for separating images based on whether the file path contains, matches, is like, begins with, ends with, is, is not....compared to the manually entered text. The file path is what specifies a file's unique location in a file system. Alpha Channel: Option for sorting images based on whether an alpha channel is present or is missing. Transparent Pixels: Option for sorting images based on whether transparent pixels are present in the image or are missing. Color Model: Option for separating images based on whether it is / is not, and choose from RGB, CMYK, Gray, and Lab. Image type: Option for separating images based on whether it is / is not, and choose a file type from the list. Bits per Channel: Options for separating images based on manually entered bits per channel value and whether image is greater than, equal to, or less than this value. DPI: Options for separating images based on manually entered DPI (dots per inch or pixels per inch) value, and whether image is greater than, equal to, or less than this value. Image Pixel Width: Options for separating images based on manually entered image pixel width value, and whether image is greater than, equal to, or less than this value. 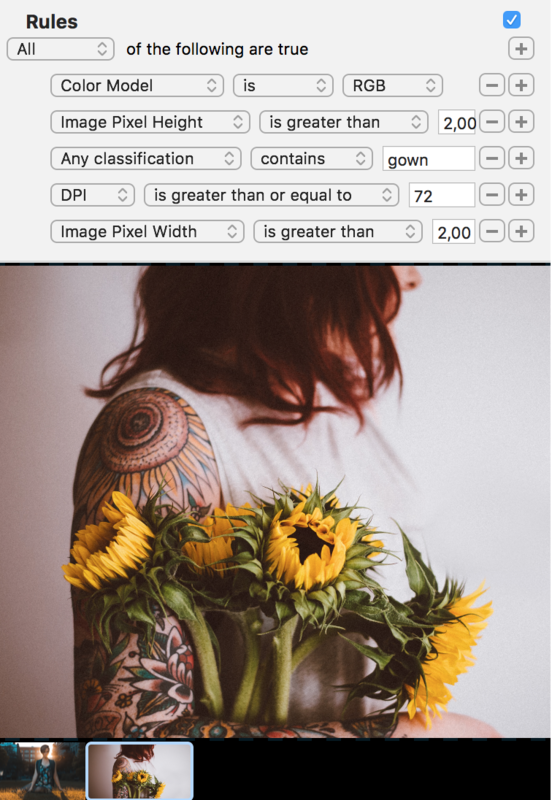 Image Pixel Height: Options for separating images based on manually entered image pixel height value, and whether image is greater than, equal to, or less than this value. Megapixels: Options for separating images based on manually entered megapixel value, and whether image is greater than, equal to, or less than this value. Images Tested: Options for limiting which images pass through the node based on the number of images being greater than, equal to, or less than a set value. Page Number: Options for limiting which pages of a multipage image such as a GIF or PDF pass through the node. Add multiple page number rules to obtain specific page ranges.